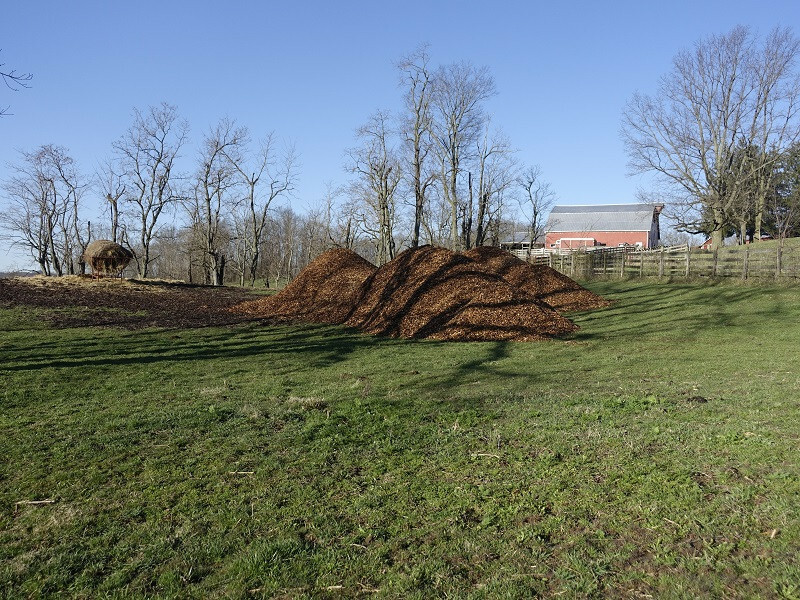 MAKING COMPOST: THESE WOODCHIPS WILL BECOME FERTILIZER. Being a grass-farmer, or grazier, is a little bit like marriage - if you knew everything about it beforehand, you'd never go into it! Fortunately, ignorance is bliss, or we'd never rise from bed in the morning. WHAT'S IN A NAME: OUR NAME WAS JUST PUT UPON THIS TRAILER. Why does one do this? Isn't it awfully brash to promote oneself in excess like this? What would one's grandmother say about being so demonstrative in public? Is it really necessary? And how important is a name, anyway? These questions arise, as the signature event of the week was installing this large banner around our large trailer. Wood frogs range from Georgia to Alaska, seeking high-quality environments in which to breed. This picture was taken in our wetlands several weeks ago. 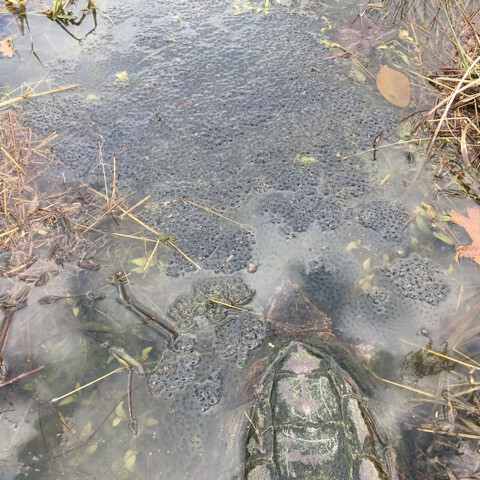 Hundreds of thousands of eggs have been laid, and a great, big, old predator - "Bucko", stands lurking in shallows, on the hunt for adult frogs. MARCHING FORWARD: THESE COWS CONTINUE TO MARCH FORWARD. As they have all winter. They are bunched together to ration grass, which stopped growing last August. We also unroll several bales of hay for them, so quality of feed comes from stockpiled pasture and quantity from hay. The winter has been mild, of course, which helps, and cows are doing amazingly well. FLOOD WATERS: THE POWER OF WATER VISITED US TUESDAY NIGHT. 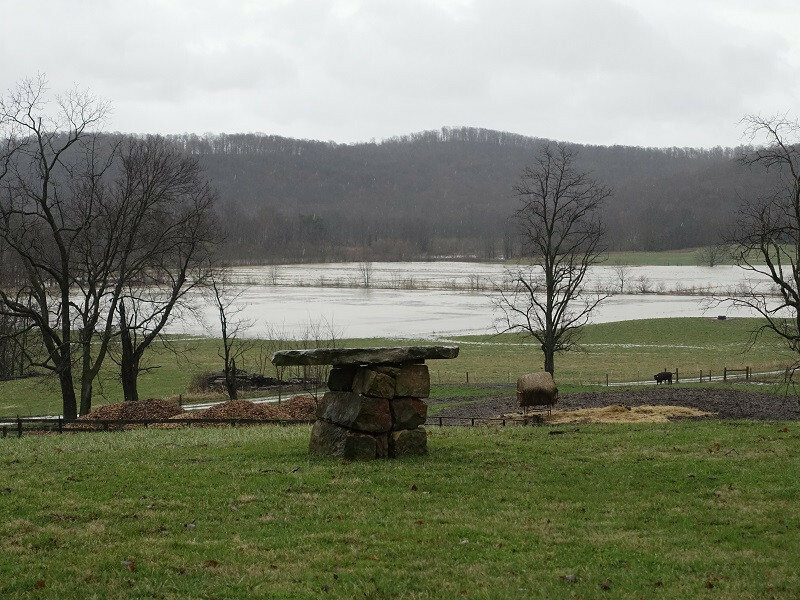 Four inches of rain fell upon saturated soils, culverts bulged, creeks rose, and fields flooded... We were reminded once again of nature's ready ability to transform the environment. It is humbling to wake up to such a transformation, especially when one has 500 animals to provide for. One feels small and powerless. 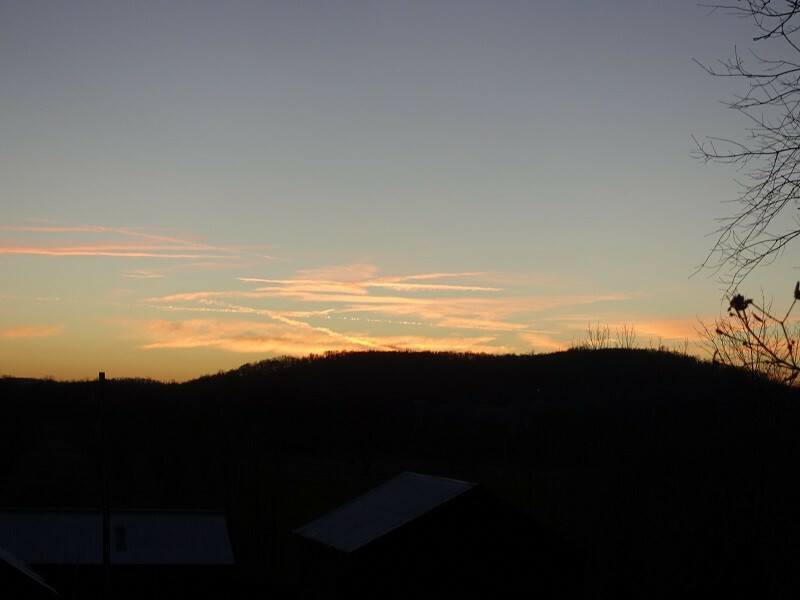 RURAL SYMPHONY: THIS LIGHT-SHOW HERALDED A MAGNIFICENT EVENING. Last weekend we sat before our outdoor firepit as the sun set, and felt regaled by nature's performance. The sun was blood-orange and the sky turquoise-blue. The two danced together for half an hour in ever-changing hues and formations. The sun finally fell below the horizon of trees, but because the trees bore no leaves, the orb of the sun remained in perfect display behind thin, black, linear trunks of trees for a few moments. The contrast was brilliant, before the sun sank entirely. It was a breathtaking sight neither of us had witnessed before. MAN'S BEST FRIEND: WORKING-DOGS ARE A MARVEL. Bo and I have been sorting and moving livestock regularly this past month. We are discovering teamwork for the first time, really, as he arrived here two years ago at the same time as Brendan, who thereafter worked with him. Bo and I are getting to know each other and it has been a pleasure to do so. Working as a team is an imperfect process, as we all know, and he tests his handler regularly. He likes to advance way ahead of the handler, creating disconnection, and has to be continually called back. But he is smart and eager to learn, and responds readily to both positive and negative reinforcement. SWEET ANTICIPATION: SITTING AT THIS MOMENT BETWEEN SEASONS, WE PONDER THE YEAR BEHIND, WHILE SWEETLY ANTICIPATING THE ONE AHEAD. The year behind was marked by developing our new kitchen and adding Milford and Findlay markets to our venues. 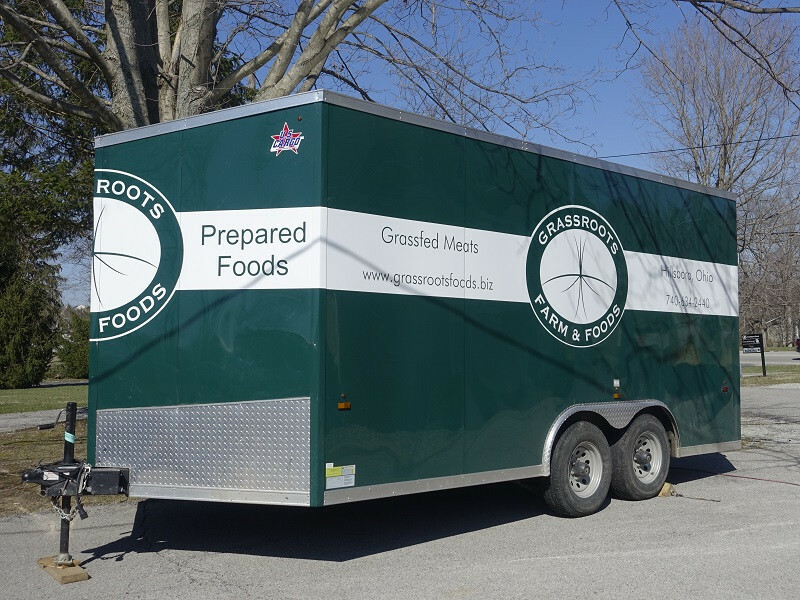 The year ahead will be marked by completing certification of the kitchen, exploring possibility of shipping prepared foods, and the usual rhythms of birth, growth, and harvest. Implicit in all of this is an ongoing dose of humility, as we step forward, make mistakes, learn, and relearn. 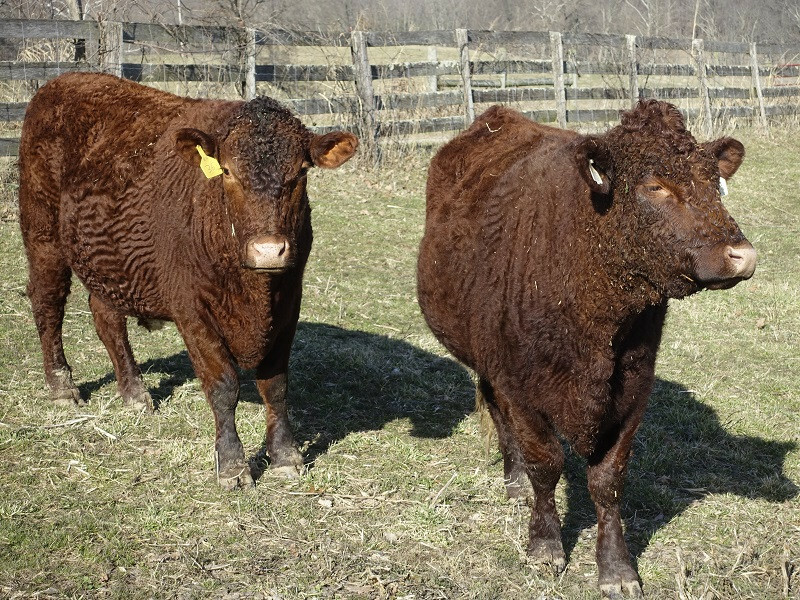 SLOW FAT: THESE STEERS HAVE PUT ON FAT SLOWLY. 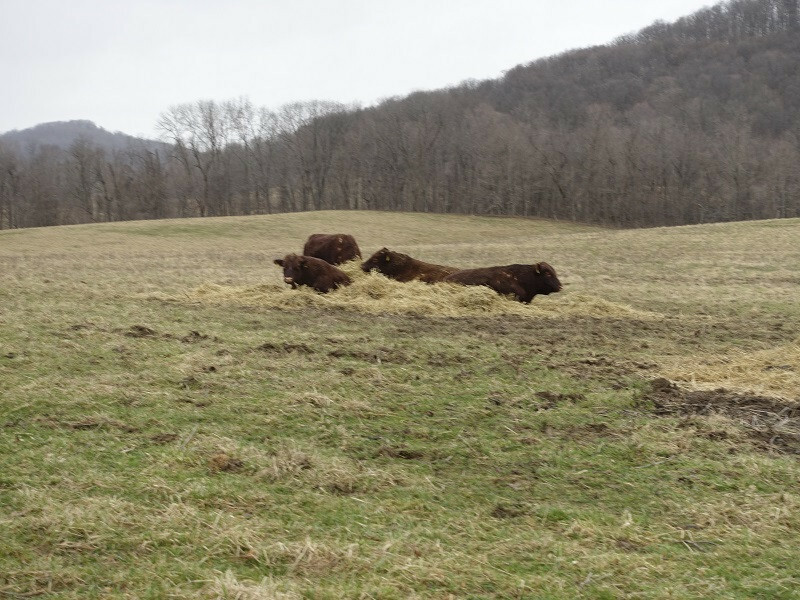 They are ready to be harvested, at four years of age rather than two, which is customary for a "finished" grassfed animal. We observe that older animals offer more flavorful fat, so we don't worry if they aren't ready as soon as the "industry" suggests. Some of our best steaks have been from 8 and 9 year-old cows, who have had plenty of time to mature. Another aspect of "finishing" a steer in 24 months or less is he needs to consume a lot of high-quality feed to do so. We finished our first batch of steers in 20 months by feeding them baled alfalfa for about six months. It worked great, but the cost was too high. Another option is to grow annuals, like Sudan grass, turnips, wheat, cereal rye, and graze or harvest those for "finishing". But those are costly to grow as well, requiring considerable equipment for tillage or use of herbicides, both of which we try to avoid. 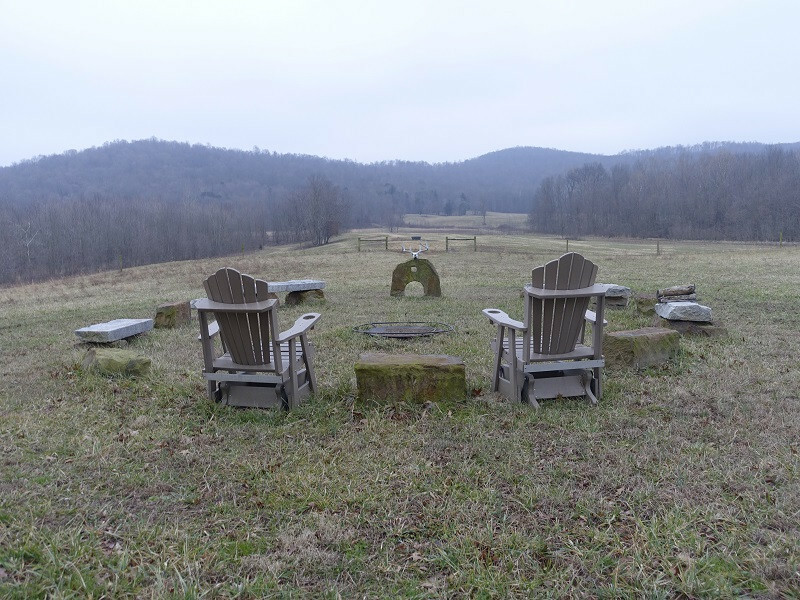 Planting annual crops means forgoing perennial forages. It is perennial forages that protect the soil and offer opportunity to build organic matter at least cost. 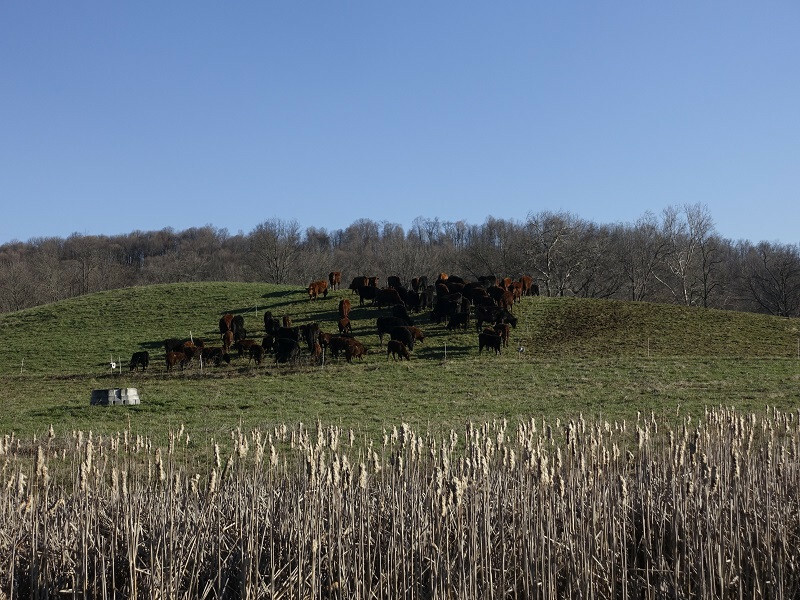 Over the past two years, organic matter in many of our pastures has increased 50%, by implementing a tight grazing plan with our growing herd of cattle. As we have discussed, organic matter is the gold standard for providing nutrients to plants and resilience in drought. In the one field we plowed for organic corn, "o.m." dropped by 50%. AT EASE: THESE BULLS REST AT EASE, AFTER COMPLETING 45 DAYS OF SERVICE TO 65 COWS. They look rather exhausted, and are finding repose upon the remains of a bale of hay. Wouldn't it be the life only to work 45 days a year, with room-service provided the balance of the time?! BLOODY & DIRTY: ONE MUST HAVE A PENCHANT FOR BLOOD AND DIRT TO RAISE GRASSFED FOODS! 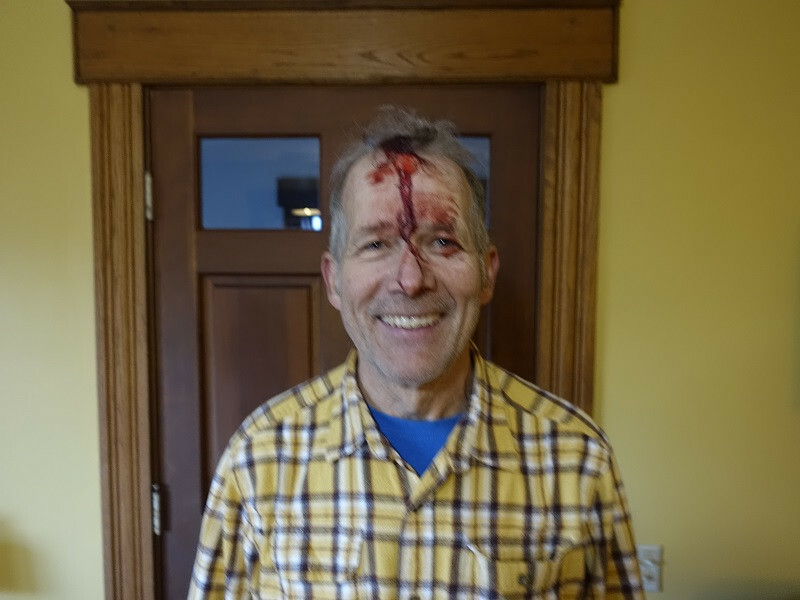 Last week the post-pounder drew blood and this week I wallowed in mud to fix a leaking waterline. Such is the unyielding dedication of grass farmers. 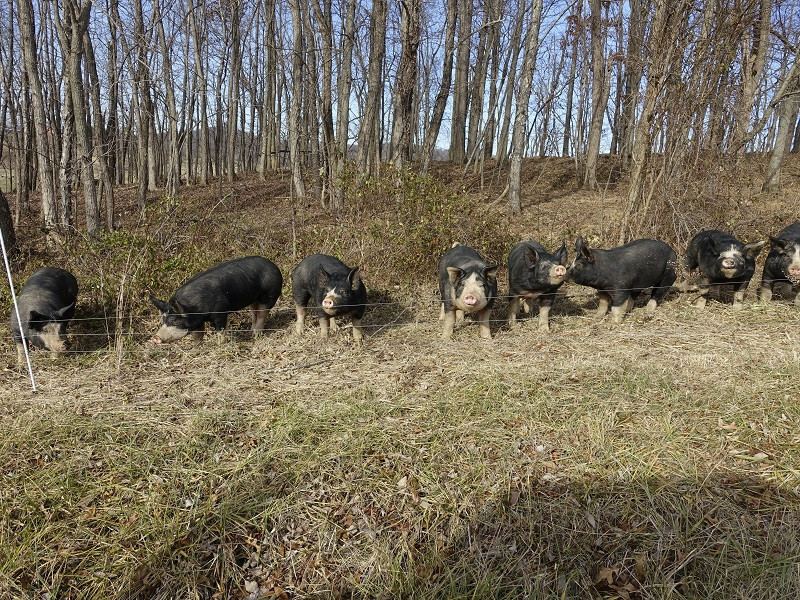 WINTER WELL-BEING: BERKSHIRE PIGS ENJOYING THE GOOD LIFE. 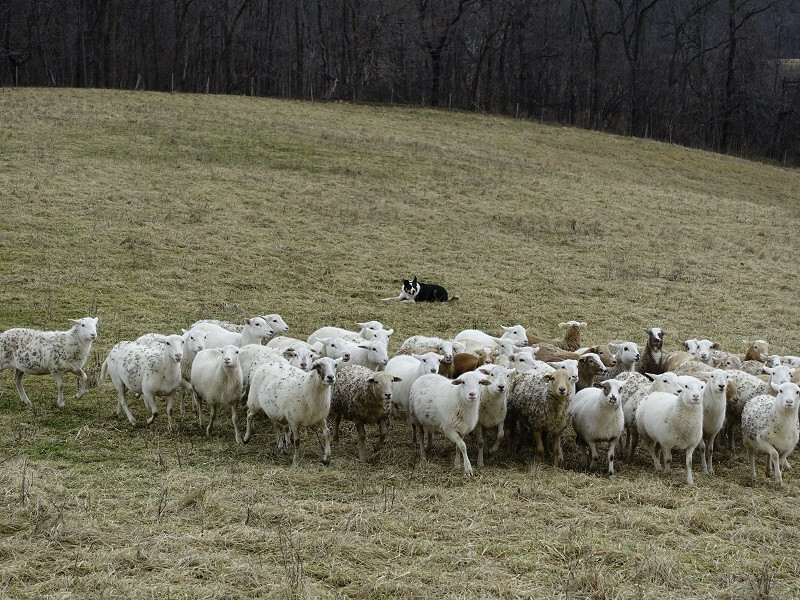 Managing livestock in the winter is simpler in some ways than during the growing season. Because grass is dormant, we don't worry about impact upon it from livestock, so we don't move water troughs as they advance forward. They go back to a central watering point within 30 acres. We also don't worry about providing shade for cattle. But if problems arise with the water system, executing repairs is a lot more challenging in the cold. One definition of misery is fixing a leaking waterline, three feet down, in wet, cold, mud... Fortunately we aren't required to do that often. Cold, dry weather is better than wet, muddy conditions. We try to keep animals out of the mud by keeping them moving. Migration is basic tenant of well-being for animals, in both winter and summer.